Page through the book of Matthew in this survey study of Jesus' life and teaching. 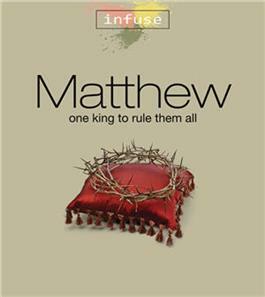 The book of Matthew introduces us to Jesus Christ from a unique point of view. Page through the book of Matthew in this survey study of Jesus' life and teaching. What was the life of Jesus all about? Who was he? Where did he come from? What were his message and purpose?See for yourself what happened in his life, who followed him, who opposed him,and why. Meet Jesus himself, and consider his purpose. Think about his call to you personally. Could he really be the one Savior and King of the whole world? This is a survey study covering the entire book of Matthew in eight sessions. Each session is divided into Episode sections in case you may wish to do just one or two episodes each time you meet together. This study includes 25 episodes in all, so, depending on the length of your usual discussion time, you might use as many as 12 to 18 meetings to complete the study. Also includes five inspirational readings that follow each lesson.